We have trial access to Shen Bao Digital Archive until 31st December 2015. This has been added to our E-Resources Trials webpage. This entry was posted in Trials and tagged Chinese Newspaper, Shen Bao on December 10, 2015 by eresources. We have trial access to Science of Synthesis from Thieme until 30th January 2016. As the only resource providing full-text descriptions of organic transformations and synthetic methods as well as experimental procedures, Science of Synthesis is a unique chemical information tool. This entry was posted in Trials and tagged Chemistry, organic and organometallic chemistry, Science of Synthesis, Thieme on December 8, 2015 by eresources. 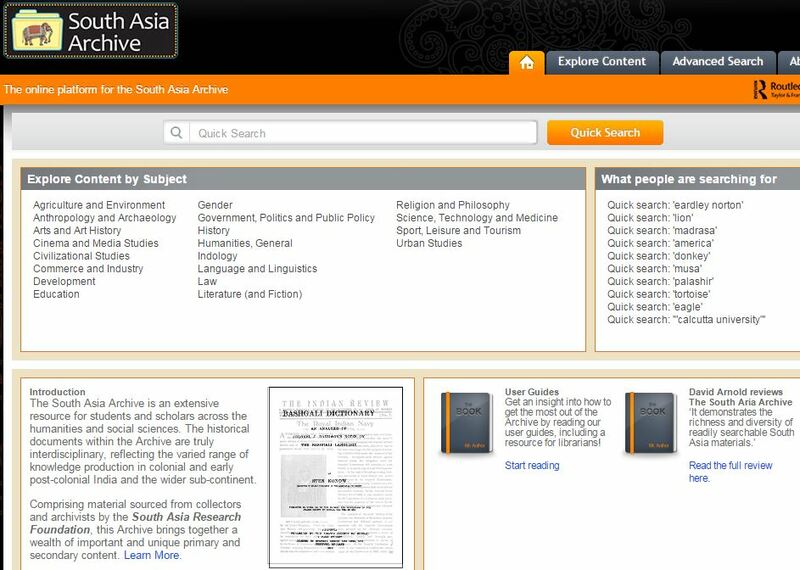 We have trial access to the South Asia Archive until 1st January 2016. This has been added to our e-resources trials webpage. The South Asia Archive is a specialist digital platform providing global electronic access to culturally and historically significant literary material produced from within, and about, the South Asian region. Contains millions of pages of digitized primary and secondary material in a mix of English and vernacular languages dating back to the start of the 18th Century, up to the mid-20th Century. Contains Journals, Reports, Books, Legislation documents and Indian Film Booklets. This entry was posted in Trials and tagged books, database, Journals, Legislation documents, reports, South Asia Archive on December 7, 2015 by eresources. We have trial access to Statista until 30th December 2015 and this has now been added to our e-resources trials webpage. Statista is one of the world’s largest statistics and market data platforms with access to more than 1,5 million statistics, forecasts, dossiers, reports and infographics on 80.000 topics from more than 18,000 sources. From the rabbit pet food market value in the UK, to the number of registered buses in Alaska, a survey of most needed changes for the Cuban population to the a breakdown of mobile gamers in China. 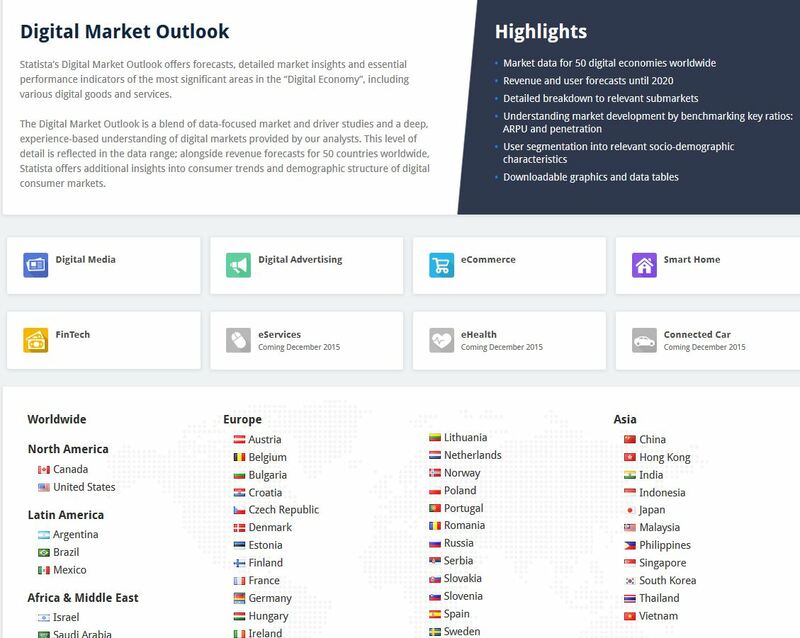 The platform combines economic data, consumer insights, opinion polls and demographic trends. All data can be downloaded within seconds in 4 different office formats. On top, every student, lecturer and member of staff receives full publication and usage rights of the data (useful if you present at a conference or want to publish sth. for example) as well as access to Statista data journalists. Automatic Citation output is included, too. Last but not least, in terms of entertainment, the infographic section can definitely compete with a youtube-evening on a cold winter evening at home! This entry was posted in Trials and tagged database, Multidisiplinary, Statista, Statistics on December 4, 2015 by eresources. Medieval Family Life – The Paston, Cely, Plumpton, Stonor and Armburgh Papers. This resource contains full colour images of the original medieval manuscripts that comprise these family letter collections along with full text searchable transcripts from the printed editions, where they are available. The original images and the transcriptions can be viewed side by side. Along with the letter collections themselves there are many additional features useful for teaching and research. 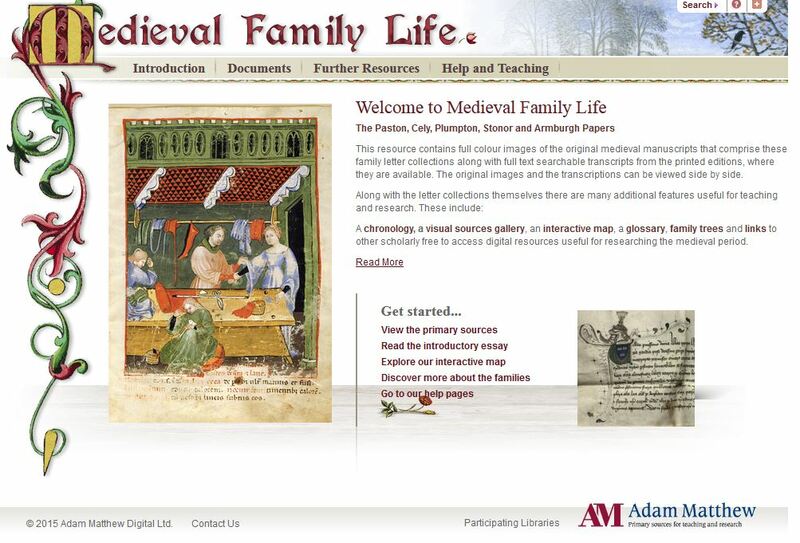 These include: A chronology, a visual sources gallery, an interactive map, a glossary, family trees and links to other scholarly free to access digital resources useful for researching the medieval period. 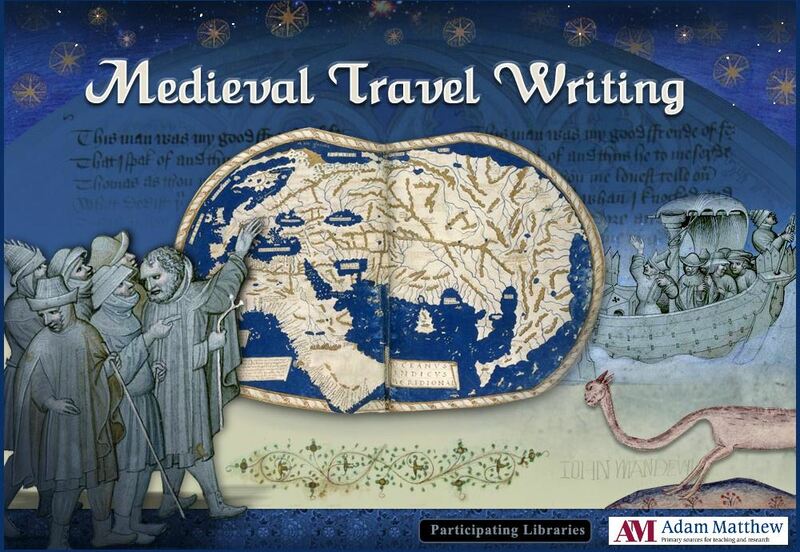 Medieval Travel Writing – this project provides direct access to a widely scattered collection of original medieval manuscripts that describe travel – real and imaginary – in the Middle Ages. We are interested to know what you think of these databases as your comments influence purchase decisions so please do fill out our feedback form. This entry was posted in Trials and tagged Adam Matthew, databases, Medieval Family Life, Medieval Travel Writing, Medieval Travel Writing and Accounts of the Far East, Travel and Pilgrimage on December 4, 2015 by eresources. 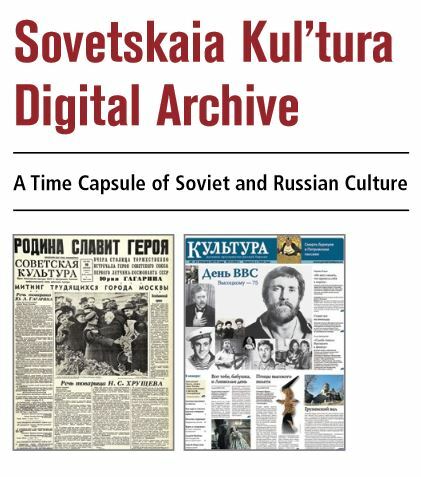 We have trial access to Sovetskaia kul’tura Digital Archive via EastView. The trial can be accessed via the e-resources trial webpage and DiscoverEd until 31st December. This entry was posted in Trials and tagged database, EastView, Newspapers, Russian Newspapers, Sovetskaia kul’tura Digital Archive on December 4, 2015 by eresources. We have on campus access to IndiaStat until 11th December. This resource has been added to the e-resources trials webpage. IndiaStat provides India-specific socio-economic statistical facts and figures from various secondary level authentic sources. 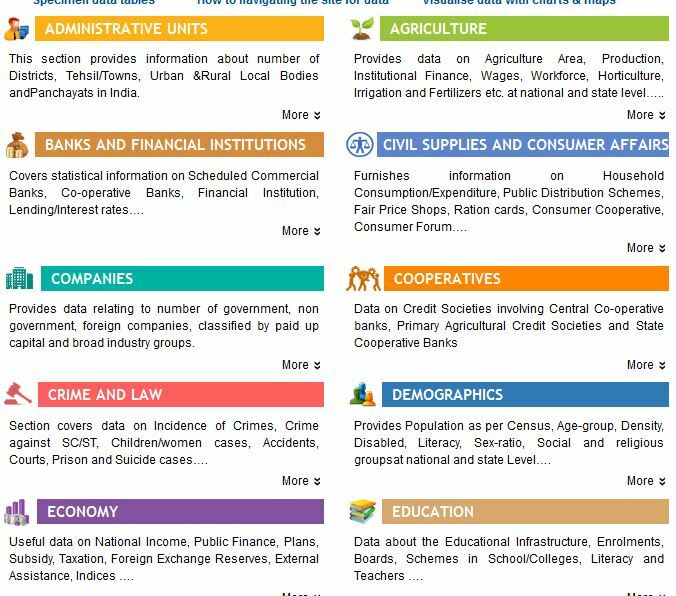 Includes 19 sector specific information including industry, education, health, banks and financial institutions, companies, co-operatives, crime and law, population, foreign trade, labour and workforce, housing, media, power, transport, urban-rural. Provides socio-economic information on 31 Indian states and union territories. Provides comprehensive information on 6 main geographical regions of India. 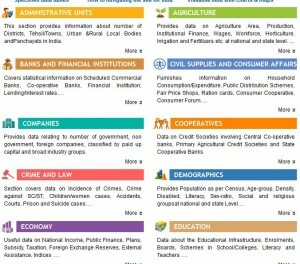 Data and statistics about India available on Indiastat.com can easily be downloaded in MS-Word/Excel/ HTML formats. To access the site, click on the Login tab at the top banner of the site and select the IP Login option. This entry was posted in Trials and tagged IndiaStats, Multidisciplinary, Statistics on December 2, 2015 by eresources. We have trial access to all of the e-books published by Duke University Press hosted on the Highwire platform. This trial runs until 18th January. The e-Duke Books Scholarly Collection consists of 2100 titles in humanities and social sciences. Key subject areas are Anthropology, Art History & Theory, Asian Studies, Cultural Studies, Ethnic Studies, Film & Television, Gender & Sexuality Studies, Latin American Studies, Political Theory and Science Studies. See the title list at https://www.dukeupress.edu/Assets/Downloads/dup_info_titles.xls (3rd tab). Access the trial via our e-resources trial page. We have also added the individual e-books to DiscoverEd. We are interested to know what you think of this e-book collection as your comments influence purchase decisions so please do fill out our feedback form. This entry was posted in Trials and tagged Anthropology, Art History & Theory, Asian Studies, Cultural Studies, Duke University Press, e-books, Ethnic Studies, Film & Television, Gender & Sexuality Studies, Latin American Studies, Political Theory, Science Studies on December 2, 2015 by eresources. Our trial to IBISWorld ends on Friday. Please fill out a feedback form if you would like the Library to subscribe. IBISWorld is an online industry intelligence solution. Covering 432 UK industries at SIC L5, each of its industry reports provides the most detailed performance data and analysis on the market; supply chain information; forecasts; risk scores; operating strengths and weaknesses; analysis of external drivers; major player market strategies; and industry profit and costs benchmarks. Reports are updated three times per year on average ensuring the most up to date research possible. This entry was posted in Trials and tagged IBISWorld, Industry Reports, Interview preparation, Multidisciplinary on December 1, 2015 by eresources.